The pilgrims who come to seek the blessings of the Khwaja make rich offerings called ‘nazrana’ at the holy spot where the saint has been entombed. The offerings of rose and jasmine flowers, sandalwood paste, perfumes and incense contribute to the fragrance that floats in the air inside the shrine. Also offered by devotees are the ‘chadar’, ‘ghilaph’ and ‘neema’, which are votive offerings for the tomb. These are brought by devotees on their heads and handed over to the ‘khadims’ inside the sanctum sanctorum. Outside the sanctum sanctorum of the ‘dargah’, professional singers called ‘qawwals’ in groups and sing the praises of the saint in a characteristic high pitched voice. People gather around them and listen attentively, sometimes clapping to the rhythm of their instruments. Qawwalis are sung and the hall is packed to capacity. There are separate places reserved for women who attend the mehfil. The mehfil terminates late in the night with a mass prayer for the eternal peace of the ‘Khwaja’ in particular and mankind in general. An interesting ritual is the looting of ‘kheer‘ (milk-pudding) which is cooked in two large cauldrons called ‘degs’ and distributed to the devotees as tabarruk (blessed food). Ajmer is 132 kms south-west of Jaipur and 198 kms east of Jodhpur. It is connected by road to Jaipur, Jodhpur, Bikaner, Udaipur and Kota. Ajmer is a railway junction on the Delhi-Ahmedabad section of the Western Railway. 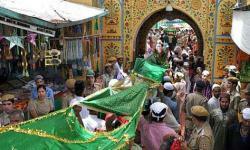 During the Urs, special buses ply from cities all over India carrying people to Ajmer and back.